I recently had the pleasure and privilege of scuba diving with Phil Renaud (Director of the Living Oceans Foundation) and other friends off the island of Grenada in the southern Caribbean. Besides being an avid diver, Phil has a great underwater camera, and knows how to use it! Below is a short (3 minute) video typical of what you can see if you venture below the surface. We dove on a small shipwreck and enjoyed closeup views of corals & critters, including a number of large sea horses. 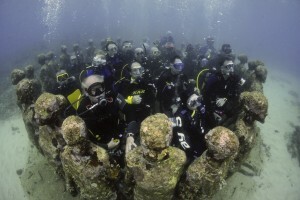 In the end, we gathered for a group photo among the Circle of Children, part of the Grenada Underwater Sculpture Park, the world’s first underwater sculpture gallery. Phil leads the Living Oceans Foundation in the one of the largest coral reef studies in history. Called the Global Reef Expedition, it will circumnavigate the globe surveying some of the most remote reefs on the planet. It will take five years to complete the field research alone.